When Emilia Bassano arrived at the English court as lady-in-waiting to Elizabeth I she was young, devout and looking for freedom and love. What she found instead was a court ruled by an aging, domineering and often cruel queen that dictated exactly what she expected from her courtiers and did not allow any variance from her plans. As the daughter of a musician, Emilia had no money or security to cushion her fall if she angered the queen and was banished from court so she saw little choice but to comply. 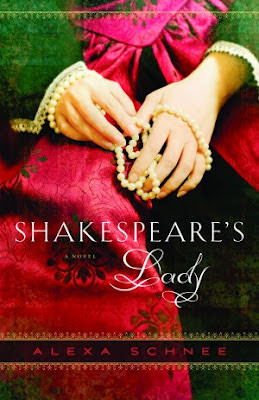 As the queen’s choices landed Emilia into the roles of mistress to the queen’s cousin, Henry Carey, and then the wife to her own brutal cousin, Alfonso Lanier, one man continued to haunt Emilia’s mind: William Shakespeare. She was fascinated by this handsome and enigmatic writer and saw her longed for freedom in his arms. But going against the queen could have devastating consequences, not only for the lovers but for those they hold dear. Could Emilia sacrifice everything she had for the chance at the life she’d always wanted? I very much enjoyed Alexa Schnee’s depiction of Shakespeare. She gives us a man that is compassionate and kind yet so dedicated to his dreams and art that he puts what he wants above everything else. I could easily picture him, smiling yet distracted with stories playing out in his head and reflected through his eyes. I also enjoyed the older, needy Elizabeth and her utter lack of compassion for what her subjects wanted for their own lives. This viewpoint helped solidify the feelings of imprisonment and lack of options that Emilia expressed throughout the novel. The author also sprinkles in well-known Shakespearean lines into the story, giving us a glimpse into where they might have originated from. Unfortunately, much of the rest of the story fell flat for me. Narrated exclusively by Emilia, I found the writing style to be rather blunt and boring. While there are moments of florid description the majority of the time the sentences are short and concise. For me it made the difference between being told the story and feeling like I was a part of it. I found Emilia to be indecisive, one moment declaring that she would do anything to be with Shakespeare and then later stating she might need to give him up if the queen disapproves. The romance between the two lovers felt lukewarm and I just didn’t feel like their actions reflected their declarations of love. I wanted to love this story so badly. It has many of the components that usually have me enthralled: a Tudor setting, forbidden love, little known characters giving me a new perspective into much-loved settings and characters. In the end Shakespeare’s Lady had enough high points for me to finish it but I cannot say I loved it or would reread it. I would, however, read something else by Alexa Schnee as I think she shows potential. Too Bad! Sounds like a big disappoitment. Thank you for the very honest review, Colleen. I have this one to read and I'm sorry to hear it's not as good as it could have been. Thanks for your honest review, Colleen. I hadn't heard of this one before. I must say, the cover is gorgeous and I like having Shakespeare involved. I HATE when a book just doesn't click for me...especially when I read reviews from others that seem to love it. It could just be me, but it just felt so so. If anyone else reads it I would love to hear what you think! Great review -- I hate it when a book is too 'telling' rather than showing. This sounds promising -- I might give it a try, someday -- but won't rush to it! I'm such a sucker for Shakespeare. I have a couple books on my shelf I need to read about him. Have you read Mistress Shakespeare or The Gentleman Poet? Just curious.